As a coach, I like to emphasis last second plays during the final ten minutes of practice. Players don't need a lot of plays to memorize; they need solid, basic skills, good conditioning, and a few plays that they can perform well when called upon to do so. 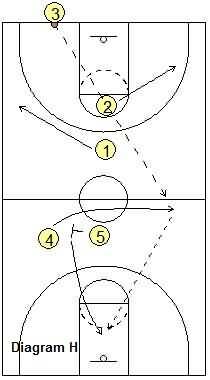 For sure, practice these plays and especially the press breaks and inbounds plays, since they are used so often. Players should understand the tempo of the game. There are three speeds in basketball: slow, fast and faster. Without knowing how to control themselves between these speeds, a player will be limited. The trick is to focus your team on aggressively trying to score and not just to get the ball inbounds, but to make some points off the inbounds play. Here are several last second plays for when the clock is running out: Write down your last second plays on a card and keep it in your pocket for when you really need it. Player 4 sets a pick for 1. Player 1 dribbles to the right wing. Player 2 screens for 3 at baseline and 5 at elbow. Player 1 can pass to 5 inside the lane or 3 at deep corner for a shot. Player 4 comes up to screen 3 with 5. 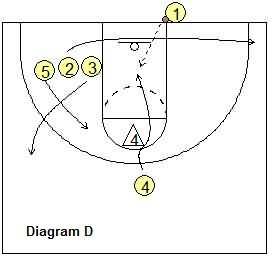 Player 5 after screens 3; down screens for 2 who flashes to the top of the key. Player 1 looks to hit 3 at ballside corner or 2 at the top of the key or a shot. Player 3 screens for 2. Player 2 goes to ballside corner. Player 1 back screens for 5. Player 5 cuts aggressively to the basket to get a lob pass from 4 for a dunk. 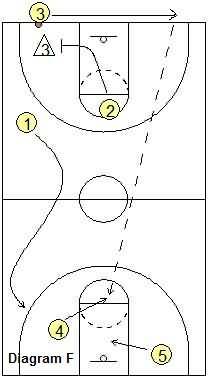 Diagram D. This inbounds play is great against a man-to-man defense that you may find most useful as an end-of-game out of bounds play. 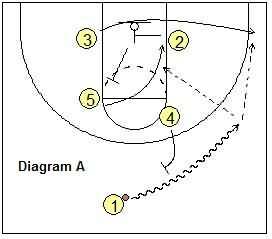 This play can be run when there are seconds or tenths of seconds left. When the official hands the ball to 1 at sometime player 3 breaks to weakside wing, player 5 flashes to the high elbow and player 2 cuts baseline to ballside corner to create a distraction and space for his teammate 4 in the box. 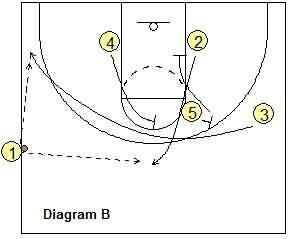 With no backside help, 1 lobs the ball to 4 for a catch-and-shoot in the air. If there are less than four-tenths of a second left, 4 will have to tap it in. This is a great play, very simple to memorize and works well. 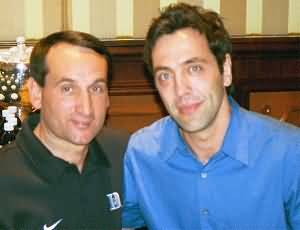 Diagram E. As a basketball coach, don't be afraid to shuffle players according to their strengths. Set up your best finisher, and use your best basketball passer for inbounding even if he or she is also your best shooter. The play starts when the official hands the ball to the inbounder 3. Remember that all players on the court watch the official and the player inbounding the ball. The play starts when the official hands the ball to the inbounder. Taking the time to slap the ball to signal the start of the play is a waste of a part of your five seconds that you have to inbound the ball. Player 2 stands at opposite low post block. Players 4 and 5 screen for 2 at baseline. Player 2 gets the inbound pass from 3 at corner for a jump shot. If 2 can't shoot from the ballside corner then 3, after inbounding, steps into court to receive a screen by 1 at opposite elbow to the ballside wing to get the reverse pass from 2 for a jump shot. 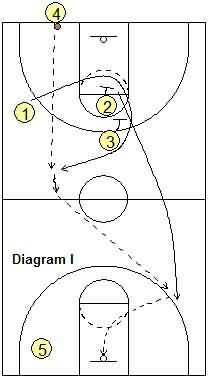 Diagram F. Player 2 begins the play by screening 3's defender at baseline. Player 3 runs outside of baseline to throwing the ball to players 4 or 5 to catch and shoot. Diagram G. You only have a few seconds left and must go the length of the floor, and you need a three-pointer. This play might at least get you a final shot. It's the moment every player dreams about -- taking the shot to win the game at the buzzer. Player 5 breaks to the ballside to get the inbound pass from 4. 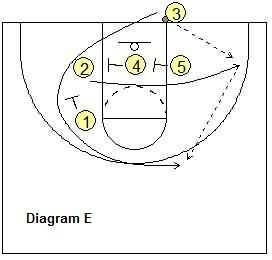 Players 3 and 1 screen for 2, the shooter. Player 2 runs down the court to get the pass from 5 for a jump shot. Diagram H. If you're trying to score quick, you want a play that also has spacing and has an opportunity to catch and go. That's what we try to do. Players 1 and 2 break opposite sides of the court to open up for player 4 who is being screened by 5. Player 3 throws the ball to 4, then 5 cuts to the basket to get the pass from 4 for lay-up. Player 1 begins the play by breaking towards the inbounder. Players 2 and 3 screens for 1. Player 4 inbounds the ball to 1. 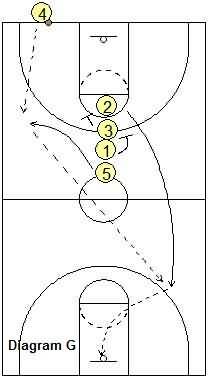 Player 1 looks for 2, who sprints down the court, to get the pass from 1 for a jump shot.